It was a busy summer for the U.S. Coast Guard. During a recent patrol, they got their hands on more than 11 tons of cocaine from eight drug smuggling boats. The vessels were stopped off the coasts of Mexico, Central and South America by crews from the Stratton, Seneca and Active. 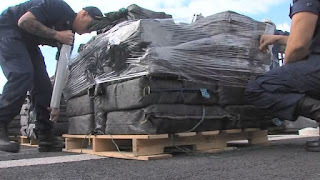 The crews seized 11 tons of pure cocaine, with a street value of more than $300 million.